2Renewable Natural Resources Center of the Semi-Arid Zone (CERZOS) CONICET, Camino La Carrindanga, Km 7, 8000, Bahía Blanca. Argentina. Doria, E. Influence of Light Stress on the Accumulation of Xanthophylls and Lipids in Haematococcus Pluvialis CCALA 1081 Grown under Autotrophic or Mixotrophic Conditions. (2018) J Marine Biol Aquacult 4(1): 30- 35. © 2018 Doria, E. This is an Open access article distributed under the terms of Creative Commons Attribution 4.0 International License. The influence of light stress and trophic environmental conditions on the production of astaxanthin, other xanthophylls and lipids from an Argentinian strain of Haematococcus pluvialis was investigated. Microalgae cultures were incubated for two weeks in autotrophic or mixotrophic conditions (with sodium acetate in the culture medium) and subjected to two different light stresses. HPLC analyses showed that: 1) regardless of the growth conditions, microalgal cells accumulated most of the astaxanthin (about 90%) in esterified form; 2) maximal increase of astaxanthin level was observed in the culture grown in autotrophic conditions subjected to moderate light stress (90 μmol photons m-2 s-1), while the same light regime in mixotrophic conditions led to a lower increase (only 25.8 fold); 3) in the case of high light stress (350 μmol photons m-2 s-1), the adaptive response of microalgae also led to a significant increase in the amount of astaxanthin both in autotrophic (22 fold increase) and in mixotrophic (16 fold increase) conditions; 4) an inverse correlation (R2 = 0.977) exists between the amount of lipids and that of astaxanthin accumulated by Haematococcus grown under different growth conditions; 5) lutein was found to be the most accumulated pigment in microalgae not subjected to light stress. Microalgae occupy the bottom of the food chain in aquatic ecosystems. These photosynthetic organisms have a worldwide distribution, and are well adapted to survive under a large spectrum of environmental stresses including heat, cold, drought, salinity, photo-oxidation, anaerobiosis, osmotic pressure and UV exposure[1,2]. Since the microalgae can combine high photosynthetic efficiency with the fast growth rate and the ability to accumulate high value-added metabolites, food, pharmaceutical and cosmetic markets have benefited from a growing array of microalgae products[3,4]. In particular, it has been reported that several microalgae, under stressing and unfavourable culture conditions, have the ability to synthesize very high amounts of a complex mixture of secondary carotenoids and ketocarotenoids, especially astaxanthin, a red pigment produced by Haematococcus pluvialis[5-7]. Carotenoids have animportant photo-protective role in photosynthetic membranes since they prevent photo-oxidative damage through quenching of chlorophyll singlet and triplet as well reactive oxygen species (ROS) generated during photosynthesis, especially singlet oxygen. Several studies have indeed demonstrated that carotenoids contribute significantly to the total antioxidant capacity measurable in microalgae. In particular, astaxanthin molecules possess an antioxidant activity higher than that of β-carotene and vitamin E, and consequently has important nutraceutical properties including enhancement of immune responses and protection against various diseases, among which are certain types of cancer. Astaxanthin is present in most red-coloured aquatic organisms and is widely used as a pigment in aquaculture (as a feed supplement for the production of salmon, trout and shrimp) as well as in the food industry and more over finds applications in pharmaceutical and nutraceutical formulations[10,11]. In recent years the green microalga Haematococcus pluvialis has been considered as the most important potential natural source for the production of astaxanthin and it has been widely studied for its high commercial value (Shah et al. 2015). Haematococcus pluvialis accumulates astaxanthin mostly in its mono- or di-ester form, as the main part of the so-called secondary carotenoids in cytoplasmic lipid vesicles, which represent up to 3 – 5% of cell dry weight[13,14]. Kobayashi et al. (1993) reported that astaxanthin production by Haematococcus pluvialis is enhanced by oxidative stress, due to its role in oxygen free radicals removal. In this species most carotenoid synthesis genes are in fact up-regulated at the transcriptional level in response to various stressors (e.g., high light, excess ferrous sulphate and excess sodium acetate). Gomez et al. (2016) studied the intra specific variability among Chilean strains of Haematococcus pluvialis for accumulating relevant amounts of astaxanthin. In this paper astaxanthin accumulation and esterification degree were investigated in an Argentinian Haematococcus pluvialis strain grown at moderate and high light stress under autotrophic and mixotrophic conditions. The content of total lipids and neutral lipids was also analysed under the same culture conditions and the correlation between the accumulation of astaxanthin and that of lipids was ascertained. Haematococcus pluvialis (CCALA 1081, Culture Collection of Autotrophic Organisms, Institute of Botany, Academy of Sciences of the Czech Republic) was isolated from rainwater in Bahía Blanca (38° 50'S, 63° 30'W), Buenos Aires Province, Argentina. This strain was maintained in culture at the Laboratorio de Estudios Básicos y Biotecnológicos en Algas (LEBBA), CERZOS - CONICET, Bahía Blanca, Argentina. In present work microalgae cell cultures were grown at 25 - 26°C, in Erlenmeyer flasks containing 2 L Bold’s Basal Medium (BBM) (Stein 1973) or BBM with the addition of 1g/L sodium acetate, under 16:8 h light/dark photoperiods, lit by cool-white fluorescent lamps with continuous bubbling of air (500 – 700 cm3/ min). Cell number was microscopically monitored by means of a Sedgwick-Rafter chamber. The initial inoculum was 4.5 x 104 cell/mL. Control unstressed cultures were grown at 35 μmol photons m-2 s-1 (LL, low light), while, in order to create moderate and intense photo-oxidative stress, light intensities of 90 (MLS, moderate light stress) and 350 (SLS, severe light stress) μmol photons m-2 s-1, were respectively used. Each experiment was performed in triplicate. After two weeks of culture, Haematococcus pluvialis cells were collected by centrifugation, freeze-dried and subsequently analysed for the carotenoid content and lipid content. Algal cells were ground using liquid nitrogen in a mortar until a fine powder was obtained; one hundred milligrams of this powder were then lyophilized and 15 mL of dichloromethane:methanol (25:75) solution were added. The algal suspension was homogenized in an orbital shaker for 5 minutes at 4°C in the dark. After sonication for 10 minutes, samples were centrifuged for 5 minutes at 10,000 xg; the supernatant was collected and the pellet was again re-suspended with dichloromethane/methanol. The procedure was repeated two more times. Finally, the supernatants were unified before analysis. An aliquot (1 mL) of the above-described extract was mixed with 200 μL of 0.018 M NaOH in methanol, in order to carry out a de-esterification of the sample. A control sample was prepared mixing 1 mL of the extract with 200 μL of methanol with no NaOH added; all the samples, in triplicate, were kept under vacuum at room temperature in the dark for 8 hours and dried in speed vacuum before being re-suspended in 100 μL of acetone and injected in the HPLC system for analysis. Carotenoids were assayed by an HPLC method adapted from that described by Tukaj et al. (2003) using a Kontron Instrument 420 system, equipped with C18 reverse-phase Zorbax ODS column, 250 mm, 4.6 mm, 5 μm (Agilent Technologies, Santa Clara, CA, USA). The mobile phase, fluxed at a rate of 1mL / min, initially consisted of 60% solvent A (methanol : ammonium acetate 80:20 v/v) and 40% solvent B (methanol : acetone, 80:20 v/v), which was brought to 0% solvent A and 100% solvent B over a period of 20 min and fluxed under these conditions for 5 additional minutes. The column was subsequently returned to its original mobile phase regime (60% solvent A and 40% solvent B) over the next 5 minutes, and fluxed under these conditions for 5 additional minutes prior to the injection of a new sample. For each culture condition freeze-dried samples of 50 mg of biomass were employed. Lipid contents (mg/g) and lipid fractionation were performed as described previously by Damiani et al. (2010). All chemicals used were of analytical grade. The data were subjected to statistical analysis performing a T Student test and Pearson correlation. Differences were considered to be significant at a probability of 5% (p ≤ 0.05). The effect of two different levels of light-stress intensities on the accumulation of lipids and carotenoids in the Haematococcus pluvialis CCALA 1081 cultures was studied. In particular, cell growth and content of total lipids, neutral lipids, glycolipids, phospholipids and carotenoids were measured. These analysis were performed in both autotrophic and mixotrophic cultures exposed to control light intensity (35 μmol photons m-2 s-1), moderate light-stress, MLS (90 μmol photons m-2 s-1), or severe light-stress, SLS (350 μmol photons m-2 s-1). As shown in Table 1, comparison of the measured growth parameter (maximal cell density reached after 2 weeks of incubation) in light-unstressed control cultures grown in autotrophic or in mixotrophic conditions showed a slightly but significantly lower value (-15%) in mixotrophic conditions. Final reached cell density of cultures either growing phototrophically or mixotrophically exposed to MLS was significantly (p < 0.05) affected with respect to controls (-32% and -24%, respectively) and decreased further in both autotrophic and mixotrophic cells exposed to SLS which caused a 53% and as much as a 95% lower growth, respectively, compared to their controls. Table 1 shows the results concerning accumulated amount of total lipids. In unstressed cultures, total lipids level was similar, while in cultures experiencing MLS it was slightly decreased (-6.5%) in autotrophic and on the contrary was increased (+32.6%) in mixotrophic conditions. SLS caused a 1.35 and 2.2 fold increase compared to the respective controls, in autotrophic and mixotrophic cultures, respectively. When the composition of total lipids in terms of neutral lipids (the most abundant fraction of total lipids, mainly triglicerydes) glycolipids and phospholipids (the less abundant fraction of total lipids) was measured, results showed that MLS did not cause relevant variations in the amount of neutral lipids neither in autotrophy nor in mixotrophy, while SLS caused a similar increase in lipid content- 56% and 51% respectively - in the autotrophic and mixotrophic culture respect to the controls. Moreover, glycolipids levels resulted rather close to those of controls in all tested conditions, while phospholipids slightly increased in autotrophic cultures exposed to MLS and much more, as much as 7.7 fold, under SLS. Conversely, under mixotrophic conditions, the level of this lipid class was not changed after MLS treatment, but was 3.45 fold increased after SLS treatment (Table 1). As to the quantitative analysis of the xanthophyll astaxanthin, collected data showed that the ratio free astaxanthin/ total astaxanthin (the latter includes both free and esterified forms) found in the different algal cultures subjected to MLS or SLS with or without the addition of acetate, was similar. 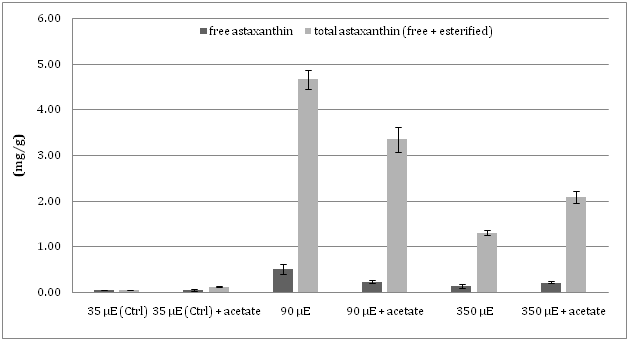 The content of total astaxanthin in all the cultures of Haematococcus was higher than that of free astaxanthin, up to ten times in MLS cultures (Figure 1). Figure 1: The level of total and free (de-esterified) astaxanthin in auxothrophic and mixotrophic cell cultures at different light intensity. In response to light stress, the amount of accumulated astaxanthin was found to undergo much more notable changes than lipids amount: autotrophic cultures subjected to MLS showed the highest level of total astaxanthin, 4.56 mg/g, 76 fold higher than that registered in unstressed control autotrophic microalgal cells (0.06 mg/g) and 28% higher than that found in the mixotrophic culture grown at the same light stress regime (3.36 mg/g). Under conditions of SLS, autotrophic cultures accumulated only 1.32 mg/g of total astaxanthin, a level still 22 fold higher than that detected in unstressed autotrophic cultures, but 37% lower with respect to cultures subjected to SLS under mixotrophic conditions (2.09 mg/g). Conversely, as already cited, in spite of the much more relevant growth inhibition caused by SLS in mixotrophic than in autotrophically growing cultures, the percentage of accumulated lipids was very similar in microalgae growing in the two different culture conditions (Table 1). Finally, the plot shown in Figure 2 clearly demonstrates the occurrence of an inverse correlation between the amount of both total and neutral lipids and the amount of total astaxanthin accumulated by Haematococcus pluvialis in the different growth conditions (R2 = 0.98 and R2 = 0.86, respectively). Table 1: Maximal cell density, total lipids, neutral lipids and total astaxanthin contents in H. pluvialis cultures subjected for two weeks to moderate (MLS) or severe (SLS) light stress with or without the addition of acetate in the medium. All the experiments were performed in triplicate. a-e: the effect of light intensity on the content of total and neutral lipids was evaluated under each trophic conditions. 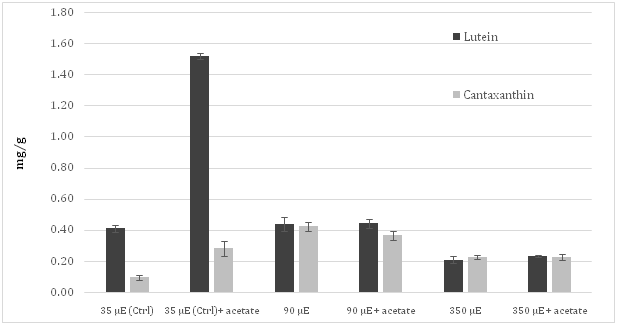 Figure 2: Inverse correlation between total accumulated astaxanthin and the amount of the neutral lipid content (a) and total lipid content (b) in Haematococcus cell cultures at different growth conditions. The content of other important carotenoids accumulated in Haematococcus pluvialis cells grown in the experimental conditions described above was also quantified. Lutein was the most accumulated carotenoid in autotrophic cultures grown under control light conditions. In addition, significant traces of canthaxanthin and of another carotenoid, presumably violaxanthin or neoxanthin according to polarity and retention time, were also found (Figure 3). The content of cantaxanthin, in cultures subjected to both MLS and SLS reached values very similar to those registered for lutein. Figure 3: Level of the lutein and canthaxantin in the irradiated Haematococcuspluvialis cultures grown autotrophically or mixotrophically. Moreover, the control culture showed a level of lutein more than four times higher than that observed for astaxanthin. However, when sodium acetate was added to cell culture, lutein level reached the value of 1.52 mg/g, almost four times higher than that measured in autotrophic culture. When cultures were subjected to MLS, the concentration of canthaxanthin increased more than four times respect to control. Moreover, SLS resulted in an evident decrease of lutein and canthaxanthin content, independently from the addition of acetate in the medium. In the present work, Haematococcus pluvialis cultures were incubated for two weeks in autotrophic or mixotrophic conditions (obtained by the addition of sodium acetate to the culture medium) and subjected to different light conditions, 90 or 350 μmol photons m-2s-1, generating, respectively, moderate or severe light driven photo-oxidative stress. We did not apply a higher light-stress in order to prevent a complete inhibition of micro-algal viability. In a recent publication, a Haematococcus strain was used as a model to study the relationships between the biosynthesis of the ketocarotenoid astaxanthin and that of fatty acids by exposing the cells to continuous illumination at 20 μmol photons m-2s-1 (LL, low light) or 150 μmol photons m-2s-1 (HL, high light). This study showed that the HL conditions increased the level of astaxanthin and fatty acid by about 50% compared to the LL conditions. Moreover, it also indicated that the interaction of the carotenoid pathway and the fatty acid pathway are feedback-modulated and coordinated at the metabolite level. Results obtained in the present work confirmed the same trend when the applied light stress was moderate (90 μmol photons m-2s-1), but when micro-algal cells were exposed to a much more intense light stress (350 μmol photons m-2s-1, more than twice the value used by Chen et al.) only the level of lipids increased significantly (almost by 50%), while that of astaxanthin clearly was decreased. HPLC analysis performed on extracts either subjected or not subjected to a treatment aimed at de-esterifying the xanthophylls, showed that, regardless of the light level and trophic environmental conditions, most astaxanthin (about 90%) is accumulated in esterified form, most probably in lipid bodies together with fatty acid and also with other carotenoids. These data are in line with those reported in the literature,which showed a percentage range of free astaxanthin from 5 to 10 percent of the total amount[21-23]. For each light-stressed algal culture, the concentrations of both lipids andastaxanthin were evaluatedand compared with those observed in the respective unstressed control cultures, grown autotrophically or mixotrophically with a low-light regime of 35 μmol photons m-2s-1. Results showed that Haematococcus pluvialis cultures stressed by excess light undergo a slowdown of growth proportional to the stress level. This are more evident in the case of the mixotrophic cultures added with acetate. This might be due to the presence of the supplied carbon source, inducing microalgal cells to direct their metabolism towards the synthesis of reserve compounds such as lipids, and secondary metabolites such as antioxidants and protective pigments, such as carotenoids, rather than of primary metabolites and cell division[25, 26]. This hypothesis is strengthened by the data resulting from the analysis of lipid content which revealed that the microalgal cultures growing in phototrophic conditions and subjected to SLS (350 μmol photons m-2s-1) accumulated a lipid amount approximately two times higher than that observed in cultures exposed to MLS (90 μmol photons m-2s-1). Moreover, although after two weeks from culture start cell number was lower in both trophic conditions (although about 10 times more in mixotrophic than in autotrophic cultures), the Haematococcus cell cultures exposed to SLS accumulated more lipids than unstressed cultures regardless of the presence of acetate in the culture medium. Conversely, the presence of acetate in the same cultures led to an increase in the astaxanthin level (1.6 times) compared to both the unstressed control culture and the autotrophic culture stressed with the same light level. Instead, in the cultures subjected to MLS, the presence of acetate in the medium resulted in a slight decrease as regards the amount of accumulated pigment, with respect to the cultures growing in the same light conditions without acetate. This might be explained by hypothesizing that microalgae, in the presence of a moderate excess of light, start to accumulate protective pigments against the photo-oxidation of photosynthetic complexes, so as to allow them to go on efficiently to carry out photosynthesis. Under heavily stressful light conditions, instead, part of the carotenoids biosynthesis is replaced by the synthesis and accumulation of fatty acids that may ensure survival and recovery of the micro-algal growth cycle in the long run. In this scenario, with photosynthetic apparatus highly stressed, a carbon source such as acetate in the medium may constitute a relevant support for cellular metabolism and promote the accumulation of pigments and lipids. Therefore, in autotrophic conditions, MLS is able to induce Haematococcus pluvialis to highly increase the synthesis of astaxanthin reaching a level around 76 times higher than that observed in the unstressed control and almost 25% higher with respect to the mixotrophic culture irradiated withthe same light amount (90 μmol photons m-2s-1)[27-29]. Cifuentes et al. (2003) found similar results when Haematococcus cell cultures were exposed to 85 μmol photons m-2s-1 of light (around 5 mg/g of astaxanthin) although the cell growth was 4.5 times lower than that observed in the experiments presented in this paper. Moreover, since the pathways of fatty acids and carotenoids have the same biosynthetic origin, an increase in the use of the common precursor (acetyl coenzyme A) by one of the two biosynthetic paths could result in a lower flow rate in the other one. Zhang et al. (2016) in a recent publication showed how, although a sustained astaxanthin content (e.g., 1% of dry weight) and production rate (2.5 mg L-1 day-1) were detected under the optimized tested conditions, a considerable number of cells died off when subjected to light stresses inducing astaxanthin accumulation. To minimize the susceptibility of dark-grown cells to light stress, the algal cells were acclimated prior to light induction of astaxanthin biosynthesis under moderate illumination in the presence of nitrogen. Introduction of these experimental conditions significantly reduced the cell mortality rate under high-light stress and resulted in increased cellular astaxanthin content. With regard to the other analyzed xantophylls, no decrease of lutein amount with respect to control was observed in samples experiencing MLS, while SLS led a halving of it. This behavior was registered both in the absence and presence of sodium acetate in the culture medium. Instead, the level of canthaxanthin, which in the control cultures accumulated in much lower amounts than lutein, under both moderate and severe light stress conditions, increased approximately up to the same levels as lutein, regardless of the presence of sodium acetate in the medium. It is not easy to compare the data obtained in this experimental work with those found in the literature, mainly due to the fact that cultivation conditions and light stress parameters are very different from each other. According to Orosa et al. (2001) , the highest astaxanthin content (22.7 mg/g) was detected in Haematococcus pluvialis cells cultured in N-free medium with 100 mM sodium acetate under high light conditions (350 μmol photons m-2s-1). According to data obtained by this author, two different phases follow one other in the astaxanthin synthesis time course; the firstone corresponds to the first 12 days of cultivation, and it is characterized by a rapid astaxanthin accumulation, mainly in free and mono ester form. The second period, after the 12th day, is characterized by a slower astaxanthin accumulation, mainly in di-ester form. Our results are consistent with this model: the esterified form of astaxanthin, the most commonly found form, was indeed detected by HPLC analysis after two weeks of microalgae cultivation. However, we found that optimizing the light stress strategy by treating cultures of Haematococcus pluvialis with a moderately stressing light intensity (90 μmol photons m-2s-1) without heavily affecting cell growth, it is possible to satisfactorily enhance ketocarotenoids production in Haematococcus pluvialis cultures. Haematococcus pluvialis cultures were incubated for two weeks in autotrophic or mixotrophic conditions and subjected to two different light conditions, 90 or 350 μmol photons m-2 s-1 in order to generate an oxidative stress. Results obtained in the present work showed that when the light stress was moderate (90 μmol photons m-2 s-1), the level of astaxanthin in and fatty acid microalgae increased about 50% respect to the level observed in the control culture, but when microalgal cells were exposed to a much more intense light stress, only the level of lipids increased significantly (almost by 50%), while that of astaxanthin was decreased. Moreover, results showed that in order to induce Haematococcus pluvialis to produce and accumulate high amounts of astaxanthin, it is not necessary that the moderate light stress is accompanied by mixotrophic culture conditions as pointed out by Heifetz et al (2000) which studied the effect of acetate on a culture of Chlamydomonas reinhardtii. In fact in the experimental conditions presented in this work, the amount of the accumulated astaxanthin is very similar in both trophic conditions. Overall, results presented in this work contribute to clarify the correlations between the synthesis and accumulation of astaxanthin, lutein and canthaxantin endowed with nutraceutical properties on one side, and of oils (total and neutral lipids) from the other side. 1. Tandeau-de-Marsac, N., Houmard, J. Adaptation of cyan bacteria to environmental stimuli: new steps towards molecular mechanisms. (1993) FEMS Microbe Rev 104(2): 119–189. 2. Guedes, A.C., Amado, H.M., Malacca, F.X. Microalgae as sources of carotenoids. (2011) Mar Drugs 9(4): 625-644. 3. Pulz, O., Gross, W. Valuable products from biotechnology of microalgae. (2004) Appl Microb Biotechnol 65(6): 635-648. 4. Richmond, A. Handbook of Microalgal Culture, Biotechnology and Applied Phycology. Blackwell Science: Oxford, UK. 2004. 5. Droop, M.R. Conditions governing haematochrome formation and loss in the alga haematococcus pluvialis flotow. (1954) Archives Microbiology 20: 391-397. 6. Brown, T.E., Richardson, F.L., Vaughn, M.L. Development of red pigmentation in Chlorococcum wimmeri (Chlorophyta: Chloro-coccales). (1967) Phycologia 6(4): 167-184. 7. Rise, M., Cohen, E., Vishkautsan, M., et al. Accumulation of secondary arytenoids in Chlorella zofingiensis. (1994) Journal of Plant Physiology 144(3): 287-292. 8. Goiris, K., Muylaert, K., Fraeye, I., et al. Antioxidant potential of microalgae in relation to their phenolic and carotenoid content. (2012) Journal of Applied Phycology 24(6): 1477-1486. 9. Kobayashi, M., Kakizono, T., Nagai, S. Enhanced carotenoid biosynthesis by oxidative stress in acetate induced cyst cells of the green algae Haematococcuspluvialis. (1993) Appl Environ Microbiol 59(3): 867-873. 10. Miki, W. Biological functions and activities of animal carotenoids. (1991) Pure Appl Chem 63(1): 141-146. 11. Chen, Y., Li, D., Lu, W., et al. Screening and characterization of astaxanthin-hyperproducing mutants of Haematococcuspluvialis. (2003) Biotechnology Letters 25(7): 527-529. 12. Sato, K., Sugimoto, N., Sakamoto, S., et al. Identification of principal pigments in Haematococcus algae color. (1998) Journal of food hygiene 39(6): 368-374. 13. Ohnson, E.A., Schroeder, W.A. Microbial Carotenoids. (1995) Adv Biochem Eng Biotechnol 53: 119-178. 14. Hagen, C., Grunewald, K., Xylander, M., et al. Effect of cultivation parameters on growth and pigment biosynthesis in flagellated cells of Haematococcus pluvialis. (2001) Journal of Applied Phycology 13(1): 79-87. 15. Li, Y., Sommerfeld, M., Chen, F., et al. Consumption of oxygen by astaxanthin biosynthesis: a protective mechanism against oxidative stress in Haematococcuspluvialis (Chlorophyceae). (2008) Journal of Plant Physiology 165(17): 1783-1797. 16. Gomez, P.I., Haro, P., Lagos, P., et al. Intraspecificvariability among Chilean strains of the astaxanthin-producing microalga Haematococcus pluvialis (Chlorophyta): an opportunity for its genetic improvement by simple selection. (2016) Journal of Applied Phycology 28(4): 2115-2122. 17. Chen, G., Wang, B., Han, D., et al. Molecular mechanisms of the coordination between astaxanthin and fatty acid biosynthesis in Haematococcus pluvialis (Chlorophyceae). (2015) Plant J 81(1): 95-107. 18. Cifuentes, A.S., Gonzales, M.A., Vargas, S., et al. Optimization of biomass, total carotenoids and astaxanthin production in Haematococcus pluvialis Flotow strain Steptoe (Nevada, USA) under laboratory conditions. (2003) Biol Res 36(3-4): 343-357. 19. Damiani, M.C., Popovic, A.C., Constenla, D., et al. Lipid analysis in Haematococcuspluvialis to assess its potential use as a biodiesel feedstock. (2010) Bioresour Technol 101(11): 3801-3807. 20. Guaratini, T., Cardozo, K.H.M., Pintoc, E., et al. Comparison of diode array and electrochemical detection in the C30 reverse phase HPLC analysis of algae carotenoids. (2009) J Brazilian Chemical Society 20(9): 1609-1616. 21. Kobayashi, M., Kurimura, Y., Tsuji. Y. Light-independent, astaxanthin production by the green microalga Haematococcuspluvialis under salt stress. (1997) Biotechnol Lett 19(6): 507-509. 22. Li, Y., Sommerfeld, M., Chen, F., et al. Consumption of oxygen by astaxanthin biosynthesis: a protective mechanism against oxidative stress in Haematococcuspluvialis (Chlorophyceae). (2008) J Plant Physiol 165(17): 1783-1797. 23. Wong, Y.K. Effects of light intensity, illumination cycle on microalgae Haematococcuspluvialis for production of astaxanthin. (2016) J Marine Biol Acquacult 2(2): 1-6. 24. Nichols, H.W., Bold, H.C. Trichsarcina polyimorpha gen. et sp. Nov. (1965) J Phycol 1: 34-38. 25. Orosa, M., Valero, J.F., Herrero, C. et al. Comparison of the accumulation of astaxanthin in Haematococcuspluvialis and other green microalgae under N-starvation and high light conditions. (2001) Biotechnol Lett 23(13): 1079-1085. 26. Peled, E., Pick, U., Zarka, A., et al. Light-induced oil globule migration in Haematococcus pluvialis (Chlorophyceae). (2012) J Phycol 48(5): 1209-1219. 27. Popovich, C., Damiani, C., Constenla, D., et al. Neochlorisoleoabundans grown in natural enriched seawater for biodiesel feedstock: evaluation of its growth and biochemical composition. (2012) Bioresour Technol 114: 287-293. 28. Tukaj, Z., Matusiak-Mikulin, K., Lewandowska, J., et al. Changes in the pigment patterns and the photosynthetic activity during a light-induced cell cycle of the green alga Scenedesmus armatus. (2003) Plant Physiology Biochemistry 41(4): 337-344. 29. Zhekisheva, M., Boussiba, S., Khozin-Goldberg, I., et al. Accumulation of oleic acid in Haematococcus pluvialis (Chlorophyceae) under nitrogen starvation or high light is correlated with that of astaxanthin esters. (2002) J Phycol 38(2): 325-331.